Solution: Aluminum, gold, and iron have densities of 2.7 g/cc, 19.2 g/cc, and 7.874 g/cc, respectively. Suppose 5.0 g of each metal were obtained. Match each picture with the correct metal. The cylinders are drawn to have the same widths but various heights and are not to scale. 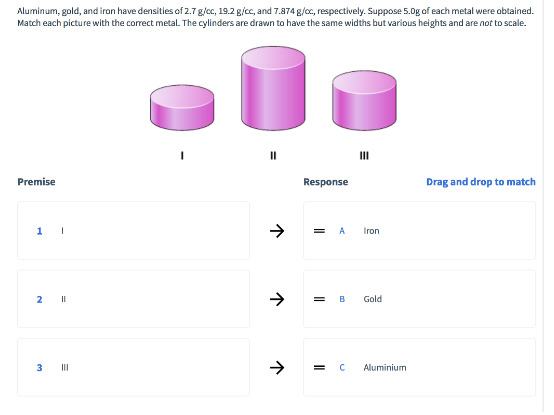 Aluminum, gold, and iron have densities of 2.7 g/cc, 19.2 g/cc, and 7.874 g/cc, respectively. Suppose 5.0 g of each metal were obtained. Match each picture with the correct metal. The cylinders are drawn to have the same widths but various heights and are not to scale.